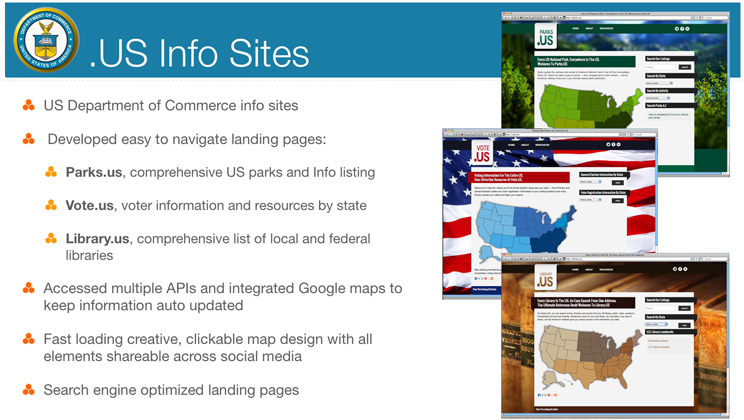 ApolloBravo developed three Department of Commerce info sites including Parks.us, Vote.us, and Library.us. The websites included a map interface for simplicity and rapid navigation. Info sites also included full Google map API and social media integration for easy sharing and discovery. The info sites are part of a campaign to promote .US domain names, US National Parks, Public libraries and encourage voter registration.